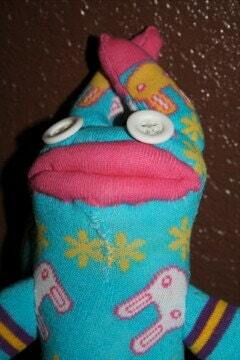 Here is the first sock creature entirely my own design. She is awesome and she rules and she is an experiment gone horribly horribly wrong. She thinks your pretty and wants to get to know you better. I have also changed the name of my Etsy shop from Awesomeguy’s creature shop to just Awesome Guys. I think that the name Awesome Guys is a better fit for how awesome I think these creatures are. Well once again check them out and enjoy. There are times when science creates something that benefits all man kind and there are times when a scientist creates something that make him or a bunch of other people lots and lots of money. Abby is neither of those. She started out, as most sock creatures do, minding her own business, hanging around a sock drawer and eating bon-bons. Everything was going fine until she decided to get a part time job at the lab. The pay was great, her co-workers seemed nice and she was advancing faster then she expected. She had already been asked to help on an upcoming project. A project entitled: Sew Luc to Abby Back.